clients . . . faster . . . and with less effort? If you said it would help you earn a lot more money, working a lot less hours, you would be correct. 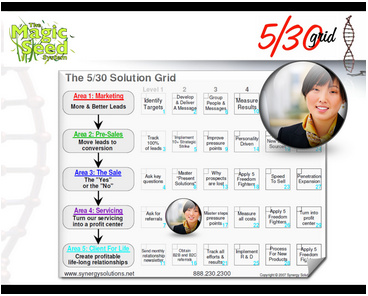 For all the boxes within The 5/30 Grid, Box 12 might be the easiest to leverage, set up a system and generate the most money with the least amount of effort. 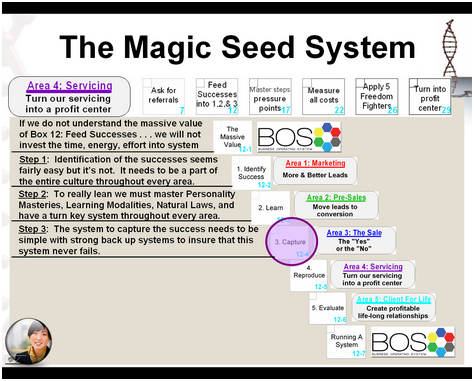 When we take the successes we have from our clients, capture those successes and then plug those successes back into our BOS - Business Operating System there are some amazing things which can happen. - Convert more leads into clients . . . FASTER !
. . . and a whole lot more. Who Should Go Through This Course? - The person / people leading up this effort. - Those in Area 4: Servicing to assist them build the system. 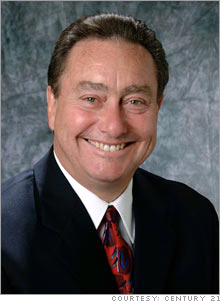 - Those in Area 1: Marketing to leverage the successes. 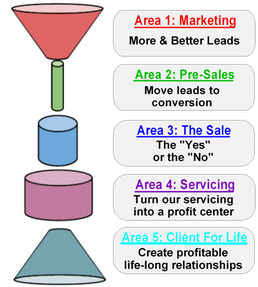 - Those in Area 2: Pre-Sales to use successes to convert more leads. - Those in Area 3: The Sale to convert leads faster. 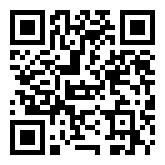 - Those in Area 5: Client For Life to gain more referrals faster. You might wonder, if capturing the success for our current clients, is so profitable, why haven’t we done this in the past? 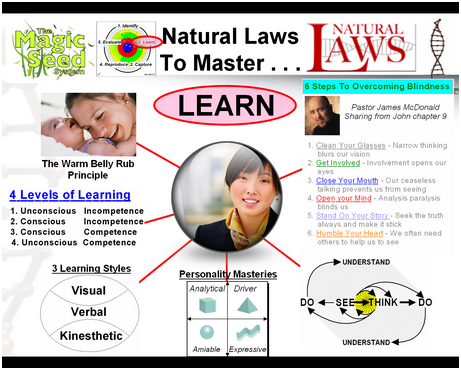 What you will learn in this course, is not taught in any business college course, is not taught in any workshop or seminar and is not coached on. Professionals and thought leaders will share that businesses should do this in passing but, in reality, do not want to take the time to really train companies how to do this specifically. The entire course was designed around the natural process of seeds and how there is a system in nature that insures that things will grow and reproduce. What would our businesses be like if we put that same type of powerful system in place within our businesses? Think of yourself as a farmer where you are planting a certain amount of seeds and from your efforts you’re getting a certain yield / return for your efforts. What if . . . someone were to come along and offer you fertilizer where you could invest a little extra money, zero extra effort / time and increase your yield / return by 25%, 50%, or even greater? You would probably take that person on up their offer. 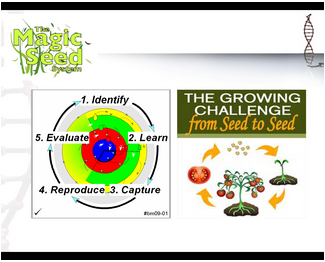 This is what the Magic Seed System can do for you. It’s a system which helps you to invest very few resources and see some amazing results. 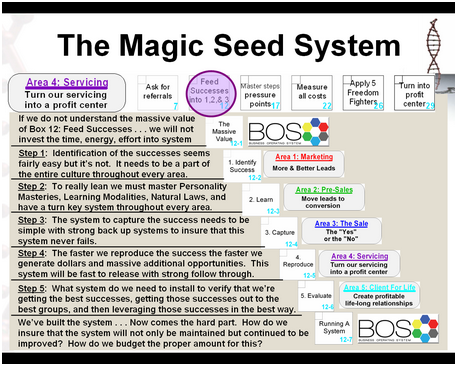 This system should be a part of your BOS - Business Operating System. 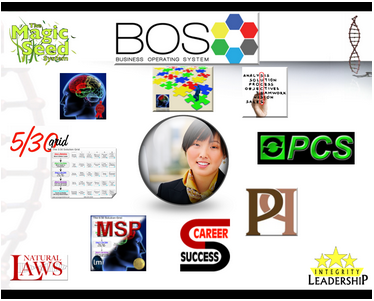 If you have your BOS already in place this will provide some amazing “fertilizer” which will bring new and exciting life to your business, your profitability, your time and your energy. If you’re getting the feeling that this course is complex we want to set your mind at ease it is not! Actually most everything you learn in this course could be understood by a high school student. The learning is not the hard part. As with most great things in life, it’s the doing that is the hard part. There is a solution for that as well as there are a group of trained and certified VA’s Virtual Assistants who, if needed, can be contracted to do all this work for you on your behalf. There are many solutions to assisting you with follow through on what you learn from this course. You can follow through on your own, be coached one on one, join a group coaching and/or a mastermind group or contract with a VA to do all the work for you. Are are actually more committed to assisting you with the follow through you do in this course than actually the things you learn. Learning will make you feel really smart . . . DOING will actually help you to earn a lot of money AND work a lot less hours, have less stress and have greater life balance in every area of your life. 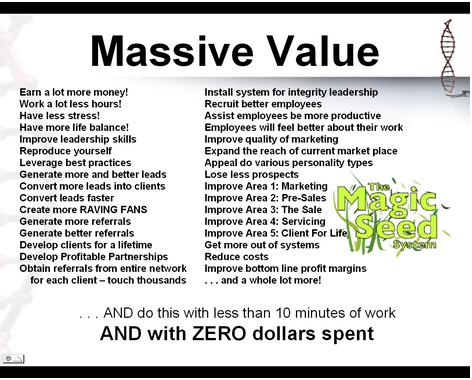 Area we learn the massive value we are then motivated to start to build and/or install the system. The first step in that is to identify the success within our business. That may sound easy to you or it may sound hard. The reality is that it is actually fairly hard. Why? Whenever we’re dealing with people and there is a need for a new behavior it is normally going to be hard to do. This is why it’s important to have a champion to lead up these efforts. This may be you, someone else in your company or you may decide to contract this to outside individuals. Getting the right individual to lead these efforts will help to insure that the system will be built, installed and run properly. This lesson will give you what to look for in this person and the skill sets that the ideal person should have. If you are the person who will be building and installing this system, no worries . . . there is an entire network of professionals you can connect with to get up to speed quickly. This position, when filled properly could be one of the most profitable positions for the entire company. This individual will be connecting with all the other individuals in the company to bring everyone’s gifts, talents, skills and perspective together to capture the “RAVING FAN” experience and then getting that very powerful message out to the market place. Now that we’ve got someone leading up our efforts and we’ve “Identified the Successes” we now have to “Learn” what caused the success and what we need to do to reproduce that success. 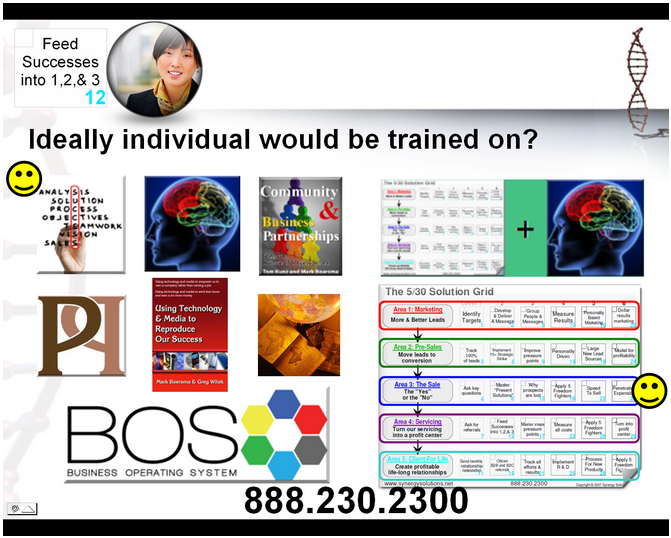 Within the BOS - Business Operating System we know that an individual’s personality has a great deal to do with their thinking and decision making process. 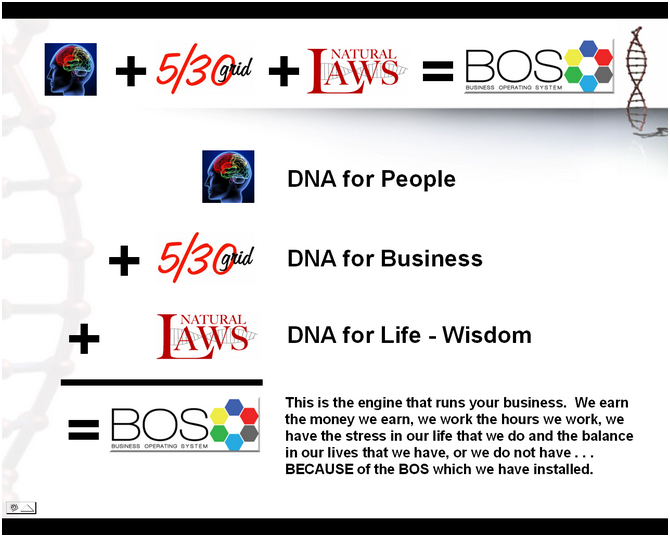 We also know that The 5/30 Grid is the DNA for the business side and Natural Laws are the DNA for Life. 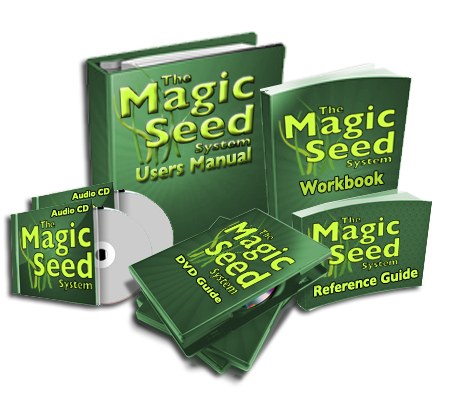 In this lesson we learn how these Natural Laws come to life in building our very own Magic Seed System. Each of these Natural Laws, when applied properly will help us to install what we call The Warm Belly Rubs i.e. the magic of the human touch, feeling, emotion, insight . . . really when you think about it, the entire human experience. We LEARN how to take “The Marketing Model” and discover the secrets to generating more and better leads, convert more of the leads we generate and how to do it faster and even how to convert more referrals from our current and past clients. Now that we’ve learned how to “Identify Our Success” and have “Learned” how we produced them in the first place and how to reproduce those success we now need to have a system in place to capture those successes. In this lesson we dig into the specifics of how to do this in the most effective and easiest way. 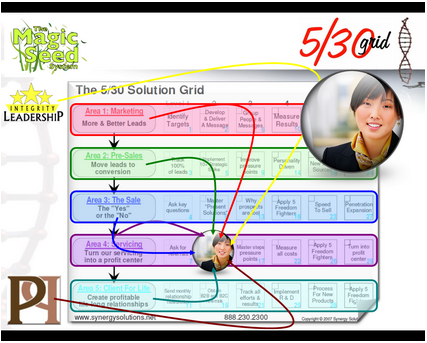 We also learn how to partner up with Area 3: The Sale i.e. the sales department and tap both their needs as well as the magic they employee to convert leads into prospects. 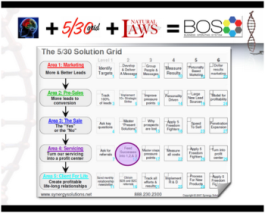 As we move through each lesson we learn the importance of each one of the five areas within The 5/30 Grid is of vital importance to building and installing this system properly. Within our BOS we know that we are only as strong as our weakest link / area and this one system [Box 12] helps us to to properly connect everything we do as a company into one fine tuned system for the benefit of all. 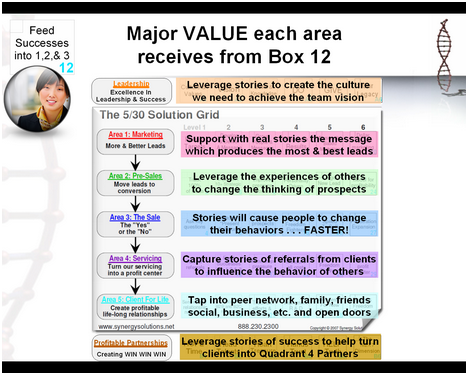 Box 12: Feed Successes into 1, 2 and 3 really help to feed the magic of success from Area 4: Servicing into every other area throughout an entire company. When we do this properly it builds teamwork, appreciation for the gifts, talents and hard work from everyone else on the team. It also demonstrates the value each person, each area has on the overall success within the team. Once we as a team can see “The Ideal” of how our BOS, our 5/30 Grid should look, and how it does look in reality, we can quickly see how much money is being lost due to inefficiencies. Obviously inefficiencies within our company are not only bad for the company as a whole but each employee as well. Due to those inefficiencies every single employee earns less money, works more hours, has more stress and has a harder time remaining balanced in every area of their life. When we properly capture each and every success we see greater success and improve morale throughout every area of our company. The next step in our journey is to learn how to “Reproduce” our success. 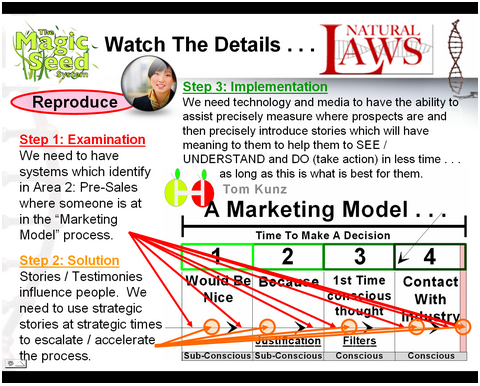 The “Marketing Model” is a most interesting model as it applies to every product / service sold anywhere in the world. 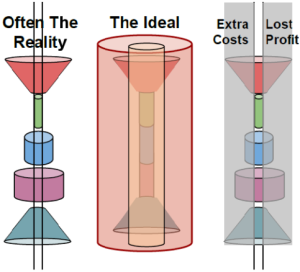 When we understand the science behind the decision making process for our prospects and then . . . almost genetically reverse engineer our system to enable this to happen we will see greater success with less effort. While this process is not brain surgery or rocket science it does take a great deal of understanding and experience as to how to reproduce a certain experience, based on a certain personality, at a certain time in the process to produce the results we so desire. Ok . . . maybe you’re right . . . maybe it is close to brain surgery! 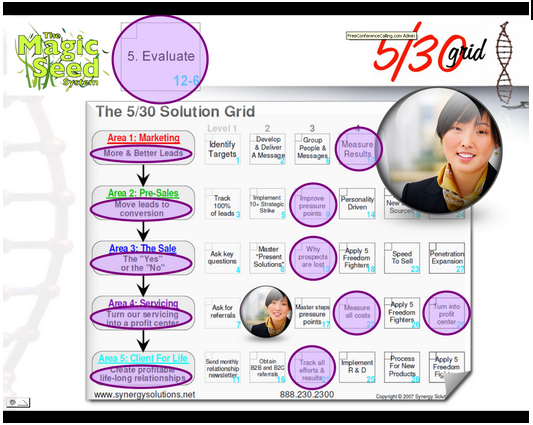 We want to reproduce the most positive experiences throughout the entire 5/30 Grid at every key point within the process. In this less we’ll learn how to not only do this for marketing / pre-sales / the sale / servicing / client for life but also within Leadership and Profitable Partnerships. Think about it . 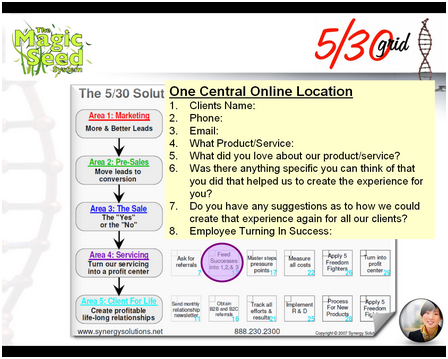 . . what if you could take your best employees, your best vendors, your best partners and . . .
and then - Reproduce that success to every other person throughout the entire company? What would that do to your company. 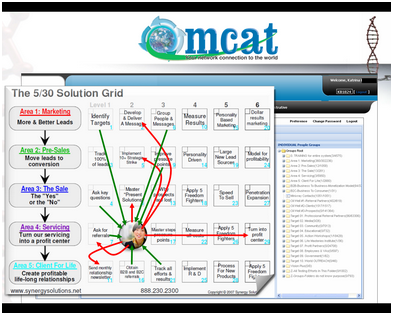 This system is far more than a marketing / sales system it is a system which can be used throughout the entire company. 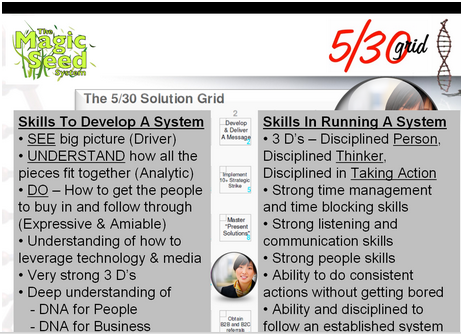 In this lesson we’ll learn how to evaluate not only this system but the impact it makes throughout our entire 5/30 Grid. 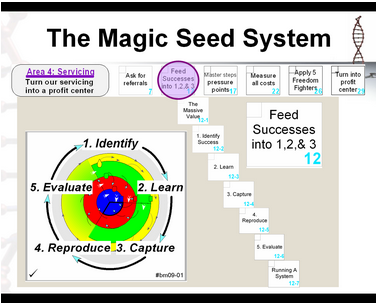 When we build into The Magic Seed System the ability to connect into each of the five areas we are able to bring new and added efficiencies throughout our entire company. 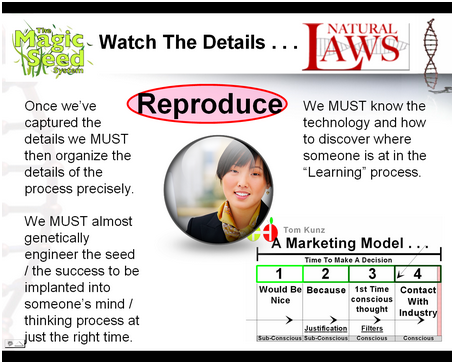 When we apply the “4 Q’s To Success Principle” and other Natural Laws we see some pretty interesting things. When we learn how to take our system to a 4, 6, or 8 we are able to convert leads which are 6, 4 or even 2 in quality. This will not happen on it’s own and there is a very good reason why in most companies it takes 10 leads to convert just 1. When we’re only converting 10% of our leads that means we aren’t getting paid for 90% of the marketing, pre-sales and sales efforts. It’s hard to have a massively profitable company, well paid employees, well staffed areas, reasonable hours, low stress and overall positive work environment when we’re not making any money on 90% of the work we do. Building and Running Our New System can be the hardest or the easiest part of the entire process . 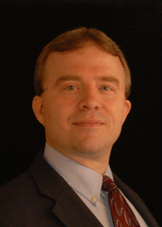 . . depending if we reinvent the wheel or if we work with proven systems, networks and resources. Just like most anything in life, if we know how to do something, it’s pretty easy and if we don’t, well . . . it’s not. 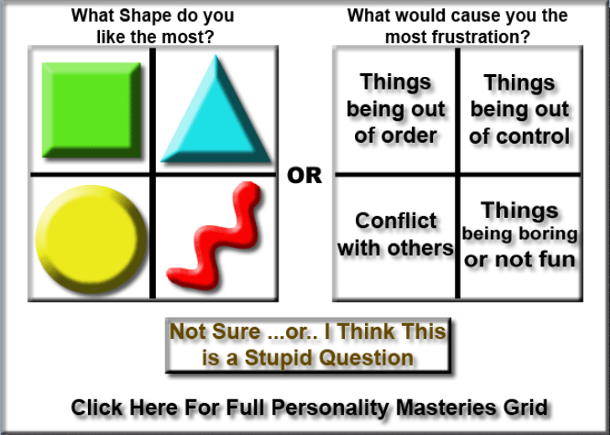 Whatever option you choose it is critical to join a mastermind group IMMEDIATELY. Those who join a mastermind group and stick with it will always follow through on the development and implementation of this system. Those who do not join a group will more likely than not, not follow through on what is learned. Most companies will choose option #2 “Have someone else build it” for some very good reasons. It will get done. It will cost a lot less in the end. It will be a stronger and more profitable. It is far easier to do. It will produce results/dollars much faster and without any disruption to other team members who probably already have their plates full. Would you build your own house if you we’re a builder? Would you take the time to learn how to repair your own car if you weren’t an auto mechanic? Would you take all the time and energy to build your own website if you weren’t a web designer? Probably not. It can take years really run a system and a lot longer to learn how to design and build a system. This is why most companies will bring in a specialized person to design and build the system for them. The money and time saved in designing and building it right the first time will far outweigh the investment to bring in a seasoned professional. VA’s - Virtual assistants who have been trained and certified by Life Masteries Institute (LMI) which is a non-profit IRS approved 501 (c) 3 organization has the most comprehensive program in the world. Those VA’s who are certified to build and run these systems go through literally thousands of hours of training and experience to gain the knowledge, skills and experience and so some amazing work. VA’s are able to build the system and hand it off to others to run it or can run it forever for you. 100% Money Back Guarantee! If you are not absolutely delighted with your investment in this course, send an email to your instructor or mentor after you have gone through three lessons within two months of registering for the course, and we will gladly refund 100% of your investment.